Minnesota International NGO Network | Connecting international NGO practitioners in Minnesota - the official and original Minnesota NGO network! The MINN Summit is a full-day conference offering international development practitioners, global innovators, and local organizations a forum to connect, share, and learn. development of international practitioners in Minnesota. buy a membership, make a donation. Networking, educational and career development events are always occurring, so check the MINN calendar for a full list! Get involved with MINN by joining one of our two committees! Volunteering with the Program or Summit Planning Committees is a great way to meet fellow international practitioners, learn from your peers, and gain valuable experience. See MINN’s expansive directory of nongovernmental organizations that work internationally and have a presence in Minnesota. Are You Getting the MINN Exclusive? Read more about Are You Getting the MINN Exclusive? 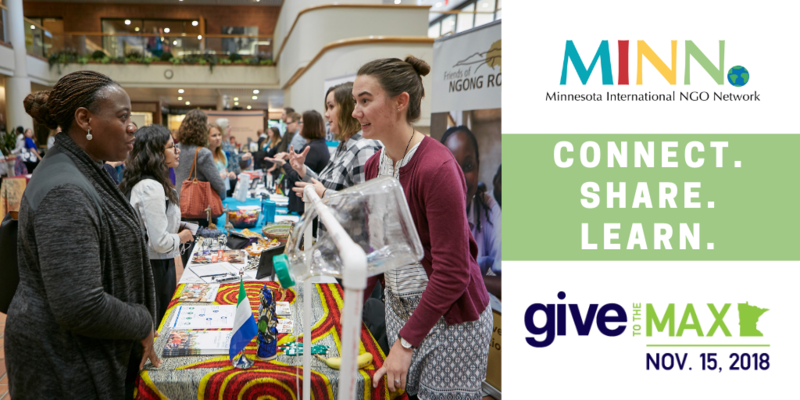 As you plan your Give to the Max Day contributions, consider partnering with MINN to create new opportunities for MINN INGO professionals to connect with one another, share best practices, and build a better Minnesota international development community. This year, we hope to match 10% of what our volunteers' contributed in the first six months of 2018. I don’t know much about current efforts to combat water-borne illnesses in Southeast Asia, nor am I an expert on the most effective ways to support refugees in North Africa. I am not sure who is doing the most innovative work on solar-ovens or water filtration in South America or the most impactful undertakings to combat gender violence around the world. I don’t know by name the most connected individuals in the local Somali community. I don’t have elected officials on speed dial or a direct line to policy makers.